— AND ALSO OIL FILTERS & OIL-CHANGE KITS! Kolpin Outdoors® is now offering two new engine oils: Kolpin Full Synthetic ATV/UTV 5W-50 Engine Oil and Kolpin 10W-40 Semi-Synthetic Powersports Engine Oil. Kolpin-branded engine oils are currently available at more than 5,300 Advanced Auto Parts stores nationwide. Unlike aftermarket brands, Kolpin engine oils are Original Equipment Manufacturer (OEM)-tested, formulated and approved for use in ATV, UTV and Motorcycle engine applications. To round out the oil line, Kolpin is offering a full line of OEM recommended Oil Filters and Oil Change Kits designed for the severe operating conditions that off-road vehicles encounter. This line of lubrication products adds to Kolpin’s robust portfolio which includes but is not limited to gun boots, Rhino grips™, snow plow systems and winches. Since 1943, Kolpin has been a trusted manufacturer of ATV and UTV accessories for Hunters, Landowners, and Recreational Riders. With almost 75 years of industry knowledge, Kolpin sets the standard for quality, innovation and design. At Kolpin, we truly understand how to redefine the industry with patented innovations such as our Gun Boot® cases and brackets, Rhino Grips, High Rise™ Plow Systems, and DirtWorks™ System. 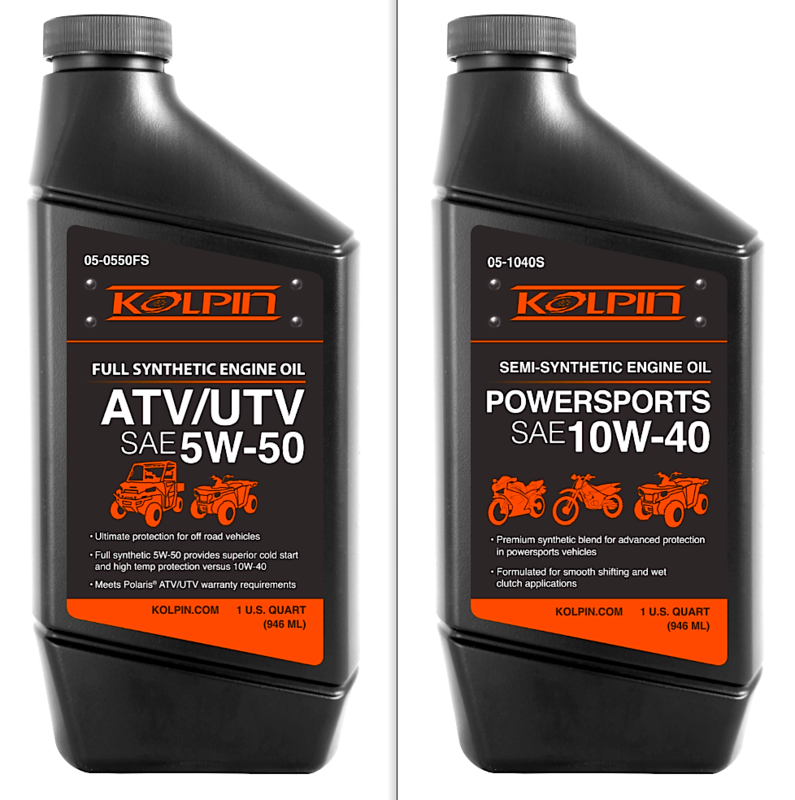 To learn about the latest Kolpin products visit Kolpin Outdoors® is now offering two new engine oils: Kolpin Full Synthetic ATV/UTV 5W-50 Engine Oil and Kolpin 10W-40 Semi-Synthetic Powersports Engine Oil. Kolpin-branded engine oils are currently available at more than 5,300 Advanced Auto Parts stores nationwide. Unlike aftermarket brands, Kolpin engine oils are Original Equipment Manufacturer (OEM)-tested, formulated and approved for use in ATV, UTV and Motorcycle engine applications. To round out the oil line, Kolpin is offering a full line of OEM recommended Oil Filters and Oil Change Kits designed for the severe operating conditions that off-road vehicles encounter. This line of lubrication products adds to Kolpin’s robust portfolio which includes but is not limited to gun boots, Rhino grips™, snow plow systems and winches. “Kolpin is dedicated to making your outdoor experience more enjoyable,” said Andy Kroll, president of Kolpin Outdoors. “Providing the highest quality, specially formulated, OEM recommended lubrication products to protect your vehicle is a big part of this experience. This offering will help us better meet our consumers’ needs and continues to position Kolpin as the leader in aftermarket accessories.” Since 1943, Kolpin has been a trusted manufacturer of ATV and UTV accessories for Hunters, Landowners, and Recreational Riders. With almost 75 years of industry knowledge, Kolpin sets the standard for quality, innovation and design. At Kolpin, we truly understand how to redefine the industry with patented innovations such as our Gun Boot® cases and brackets, Rhino Grips, High Rise™ Plow Systems, and DirtWorks™ System. To learn about the latest Kolpin products visit www.kolpin.com. For more information about Kolpin visit www.kolpin.com. To learn more about Advance Auto Parts, visit https://www.kolpin.com. To learn more about Advance Auto Parts, visit Kolpin Outdoors® is now offering two new engine oils: Kolpin Full Synthetic ATV/UTV 5W-50 Engine Oil and Kolpin 10W-40 Semi-Synthetic Powersports Engine Oil. Kolpin-branded engine oils are currently available at more than 5,300 Advanced Auto Parts stores nationwide. Unlike aftermarket brands, Kolpin engine oils are Original Equipment Manufacturer (OEM)-tested, formulated and approved for use in ATV, UTV and Motorcycle engine applications. To round out the oil line, Kolpin is offering a full line of OEM recommended Oil Filters and Oil Change Kits designed for the severe operating conditions that off-road vehicles encounter. This line of lubrication products adds to Kolpin’s robust portfolio which includes but is not limited to gun boots, Rhino grips™, snow plow systems and winches. “Kolpin is dedicated to making your outdoor experience more enjoyable,” said Andy Kroll, president of Kolpin Outdoors. “Providing the highest quality, specially formulated, OEM recommended lubrication products to protect your vehicle is a big part of this experience. This offering will help us better meet our consumers’ needs and continues to position Kolpin as the leader in aftermarket accessories.” Since 1943, Kolpin has been a trusted manufacturer of ATV and UTV accessories for Hunters, Landowners, and Recreational Riders. With almost 75 years of industry knowledge, Kolpin sets the standard for quality, innovation and design. At Kolpin, we truly understand how to redefine the industry with patented innovations such as our Gun Boot® cases and brackets, Rhino Grips, High Rise™ Plow Systems, and DirtWorks™ System. To learn about the latest Kolpin products visit www.kolpin.com. For more information about Kolpin visit www.kolpin.com. To learn more about Advance Auto Parts, visit www.advanceautoparts.com. THE NEW JUNE 2017 ISSUE IS HERE!